Villa Yakinthi is situated in a beautiful and quiet place. Just 20 meters from the sea. Is Surrounded with Olive trees and fruit trees and the beautiful natural environment will offer to the guests peaceful moments with view to the sea. Within Walking Distance is the ‘Kavos Psarou’ harbor, a safe place for small boats and the famous sandy beach ΄Psarou Amboula΄, ideal for swimming and sunbath. At 20 - 200 meters there are traditional tavernas , supermarket and a bakery. Villa Yakinthi includes 3 bedrooms that accommodate up to 5 persons, spacious bathroom, living room and a fully equipped kitchen with refrigerator, electric stove, microwave, kettle, coffee maker, toaster and all the utensils. Air conditions are installed in all rooms, wifi is available and a TV is installed. The terrace offers sea view through a beautiful garden. In addition private parking with no extra charge is available. For everything that guests of Villa Yakinthi may need , the owner lives in a closing distance and will be happy to offer the best and memorable holidays. Thank you to Pavlos who was the perfect host. He met us at the villa and gave us a lift to the supermarket and back, although had already made sure that the fridge was stocked with juice and water and that tea, coffee and sugar was available. The villa was exactly as described and was extremely clean. The photos inside are accurate, but the outdoor spaces are far better than shown. There were so many lovely places to sit and relax that, although holidaying with my husband and 4 children, there was plenty of space not to feel crowded. The sea was a very short walk away and we were happy not to hire a car but simply to go from the villa to the beach and back, to a lovely restaurant on the waterfront for tea and make the occasional 2km excision to the bakery and supermarket on the bikes provided. As if our stay hadn't already been lovely, Pavlos also gave us some local olive oil on our departure, that hopefully will remind us of our lovely holiday each time that we use it. 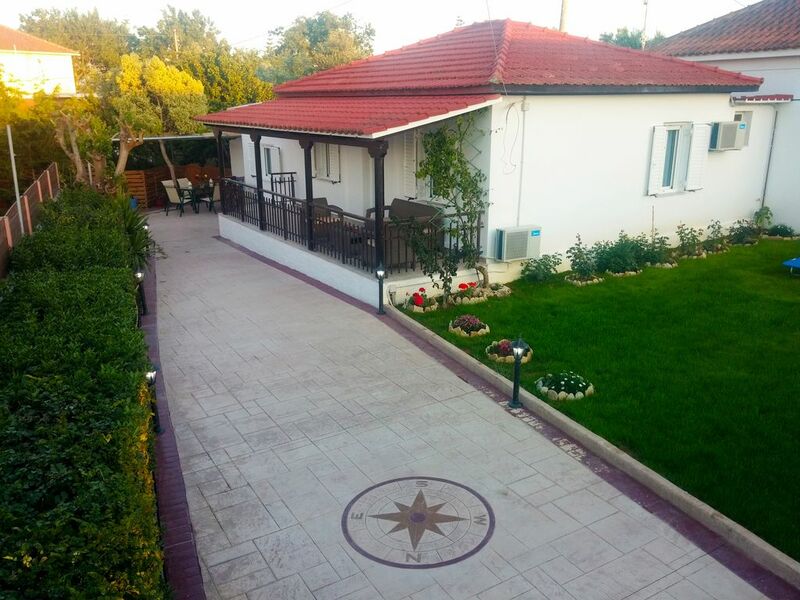 Beautiful Villa to enjoy and relax in a nice and new Villa very close to the beach! Thank you very much for your kind words. We hope seeing you again. Have a good winter. Wir waren zu viert (2 Erwachsene und 2 Kinder) in der Villa Yakinthi. Das Haus ist unheimlich gut gepflegt mit sehr viel Liebe zum Detail. Es gibt einen schönen Garten mit Liegestühlen. Zum Meer sind es etwa 50 Meter. Gleich in der Nähe ist ein kleiner Sandstrand. In unmittelbarer Nähe auch 2 gute Restaurants. Wir waren begeistert von der Freundlichkeit und dem Service der Vermieter. Das Haus wird jeden dritten Tag gründlich gereinigt und man bekommt neue Bettwäsche und Handtücher. Die Lage auf Zakynthos ist in einer Gegend, die touristisch glücklicherweise nicht überlaufen ist. Von uns eine klare Empfehlung. Thank you very much for choosing us for your vacations and for your kind words. We were pleased to meet you and we hope to see you again. Groot huis, prima bedden, 6e persoon geen probleem. Onze 13 jarige jongens hebben in de woonkamer op de bank en slaapbank geslapen. Binnen en buiten super goed onderhouden. Een auto is geen overbodige luxe. Gastheer Pavlos is niets te veel. Hij heeft goede ideeën, denkt mee en reageert vrij snel op je appjes. Keuken is zeer goed uitgerust. De werkelijkheid is nog beter dan de foto's. Kortom, super verblijf op het mooie groene eiland Zakynthos. Tutte le indicazioni indicate sono reali. La casa è molto accogliente e gli spazi sono ben disposti. Anche l'area verde esterna è ben curata e si può tranquillamente prendere il sole dopo un bagno nel mare che dista massimo 50 mt. Non c'è spiaggia ma si può fare il bagno in un acqua limpida. Ogni tre giorni venivano fatte le pulizie con cambio biancheria. Il proprietario Pavlos con sua madre sono molto gentili. Ci hanno preparato un buonissimo dolce e regalato alla partenza dell'olio di loro produzione.Nella zona ci sono molte taverne dove si mangia bene a prezzi contenuti. La zona è tranquilla ed è strategica per girare tutta l'isola. Da consigliare. Had a great time in this beautiful house. The garden is great with multiple places to sit, in the big garden at the front and the small garden at the back. We've been here with our two children (4 and 1 year old), easy that the garden is closed so the children can play outside safely. Clean, pretty and spacious house. Pavlos and his family made us feel so welcome. Cleaned every couple of days and changed bedlinen and towels. The house is in a very quiet area. 50 meters walk from the sea (a small rocky beach) and a restaurant around the corner. 1,5 km walk to a supermarket and a bakery. We did rent a car for almost the whole vacation. A couple of days without a car is fine, but better rent a car to get around, cause there's not much close by. 10 minutes by car and you're in Tsilivi, with a lots of restaurants and shops. Great place to rent for a relaxing and quiet vacation! !